I hesitate to label Tobin a picky eater, because I don't want the perception to become the reality or whatever. But. He is quite opinionated about what he will and won't (even try to) eat. And sometimes those opinions don't make much sense. Tonight we went to local Tex-Mex place for dinner with Matt's parents, who we're visiting for spring break this week. We had a lovely afternoon at the zoo, and when we were in the car on the way to the restaurant, I offered Tobin snack options since he hadn't eaten for a while: Cheerios or a strawberry cereal bar. He said a definitive "no" to Cheerios, which are usually a perfectly fine eating option, and "yes" to the cereal bar. T finished the cereal bar, and before he could finish chewing the last bite, he started signing "more" with his hands. I asked if he wanted another one, and he nodded, so I gave him another, and he ate it all. So another thing you should know about Tobin is that this amount of food is a ton for him to eat at one time. When we got to the restaurant, I didn't worry about trying to order something for him because he had such a "hearty" snack. I figured he could just eat some of my tortilla or beans (he's taken to black beans lately) if he seemed interested. As it turned out, Tobin was interested in neither, but he did enjoy dipping a tortilla chip in salsa and licking the salsa off. The salsa was really mild, and he would only occasionally make a face and spit out a cilantro leaf. He never really ate a tortilla chip--would just get a new one when the one he was using got too soft. We all got a kick out of the salsa-eating-chip-licking boy. Then I gave him the lemon from my water because I wasn't sure if his grandparents had seen him eat a lemon. He likes lemons and does not even make the slightest sour face. Of course, tonight he topped previous lemon-eating feats by (a) dipping the lemon in the salsa AND REPEATING and (b) eating a chunk of the rind. Tobin washed down this dinner of salsa and lemon with a few sips of Matt's "Ashley juice," which as you may remember is supposed to be sweet tea but Matt drinks unsweetened tea. I thought T wouldn't want anything to do with the unsweetened variety (because I sure don't! ), but he drank it as if it were no big thing. I kept trying to sneak him sips of water instead, because the tea was caffeinated but he would catch me. Fortunately, he didn't drink too much. So let's recap. For dinner, my son ate two cereal bars, a few tablespoons of salsa, most of a lemon wedge including the rind, and a few ounces of unsweetened iced tea. I could feel guilty about this, but I'm choosing mostly to be amused. And also hoping he doesn't wake up with a tummy ache. We hope to post some Easter photos soon. (Thank you, Matt, for posting the video to tide the masses over.) Prepare yourself for cuteness. Tobin went a little more casual with this year's Easter outfit (no sweater vest), but maintained the level of adorableness. Actually, I think he gets more endearing by the day, so I'm gonna go ahead and just say that he is cuter than he was last year. Of course, we believe that Easter is about more than eggs and clothes and candy, but I think those are all fun ways to introduce Tobin to the larger idea that Easter is special and important. We were so happy to have Aunt "Ackley" and Great Aunt "Weez" with us for the long weekend, visiting from "Ju-ga" and "Weez-i-hannah" respectively. (T is killing on the geography these days--even knows that "allilators" live in "Fo-ri-duh" just like Mimi and Grandpa.) We all went to the Easter service at our church, where Tobin seemed to enjoy the music before succumbing to a nap while sitting in his daddy's lap. As we were leaving the sanctuary, our pastor noted how adorable just-woken Tobin was and Matt quipped that Tobin found "peace" in the service. Our pastor then said something, "Ah, I have that gift." The rest of the day was spent just hanging out: eating, watching basketball, egg hunting, Tobin taking a second nap in mama's arms while she watched basketball, decorating cookies, and then eating the cookies. Tobin loved the Easter eggs, especially finding exciting things inside them, which in this case included jelly beans, chocolate eggs, and pennies! We even let Tobin eat one chocolate egg and probably like four jelly beans. He has developed quite a fondness for jelly beans, but not in the way you might think. We've given him one (just one) each night at the end of dinner and he holds it between his fingers and says over and over "jella beany!" (imagine an almost Italian inflection). Last night, he had licked the jelly bean a couple of times but was just carrying it around after dinner, and I was kind of unsure about how to get him to relinquish it before he got in the bathtub, because I didn't want him taking it in there. Food and baths don't mix, even for toddlers, I'd argue. Fortunately, right as I was offering to keep the jelly bean safe on my dresser until after the bath, Tobin popped it into his mouth and happily chewed it "all gone jella beany." So Tobin's second Easter was really lovely, replete with family, church, naps, and probably too much sugar. Tobin was given an Easter egg last weekend by a neighbor. Since then, "egg" has become a regular part of his vocabulary. Yesterday Allison hid a few eggs in the yard and gave him a basket. As you'll see, he did a pretty good job in his first hunt. I remember reading a baby book (imagine) sometime last year to get a sneak peak of what I would be in for when Tobin neared 2 years of age. There was an anecdote that struck me as especially ridiculous. I don't remember the exact wording, but the gist was this: Toddlers can be so particular about food that they may refuse sandwiches or meals made differently than the way they expect. For instance, if a kid likes a PB& J with the peanut butter spread first and you offer a PB&J with jam spread first, he might refuse it. I laughed this off like so many other accounts of tantrums and behavioral eccentricities that Tobin seemed to have eschewed in his development. But Tobin has developed elements of this particularity. For example, Tobin no longer eats "yogurt." But he loves it when it's called "big big yogurt" and comes from the pint-sized container. Oh, and it has to be served in his yellow bowl. Allison made the mistake one afternoon of fixing yogurt (excuse me, big-big yogurt) in a red bowl. It was summarily refused until I transferred it o the proper bowl. The same is often true for cups of juice: Purple cup with red lid? Acceptable. Yellow cup with blue lid? Unacceptable. 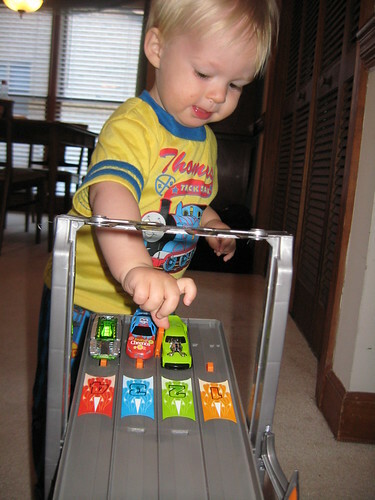 Similarly, Tobin is particular about his favorite toy, the Hot Wheels racetrack. This weekend, he and I were playing together nicely when he grabbed a car and left the room. It was time for Mama to play, and she was given a specific car to place on the track. This car is the one that we're given most frequently. It's called "Mama Cheerio car" and "Daddy Cheerio car" alternately according to who is called upon to place it. (I don't think it's a coincidence that it's also the slowest car of the regular half-dozen that race, but I'll save that for another post someday.) When it's time for Mama to play, Daddy had best not touch the track or the Cheerio car. When it's time for Daddy to play, Mama may watch but not touch. Also this weekend, I introduced Tobin to a soccer ball and basketball. Saturday we were playing with both on the deck when Tobin asked for a walk. Because Allison was busy, I could only manage one ball and Tobin on the walk with certainty that I could protect all involved from car danger. It was a lot to ask of Tobin when I said "One ball; either soccer ball or basketball." Twice we made it to the bottom of the steps on the deck when T changed his mind. The compromise was two walks: one with the soccer ball and one shorter one with the basketball. Later in the day, we were playing again when I was suddenly not allowed to play any more. This was communicated to me with a simple "Daddy no basketball. Bye bye basketball." Any touching of the basketball afterward elicited protest. When I misinterpreted "bye bye basketball" to mean "Put that away, please," I was met with fat tears after closing the storage room door. All tears abated when both balls were out on the deck and Tobin could wander between them like an indecisive bee torn between pollinating two flowers. Tobin has more funny particularities. Which song may play, whether the TV may be on, dismissing everyone from the dinner table, and who reads which book are just a few of the topics on which he expresses his opinion strongly. The neat thing is that I don't mind it at all. T is rarely inconsolable. It's fun to watch him ordering his world and categorizing likes and dislikes, even if it seems to defy logic or reason every once in a while. M: What color is the man's hat? M: Yes, yellow. What color is the man's tie? M: Yes, yellow. What color is Daddy's shirt? M: Yes, yellow. What color is your moon light? M: Yes, yellow. Very good. Now what color is a banana [eaten earlier as a snack]? In T's defense, he was having to remember the color of the banana since it wasn't right in front of him. And four out of five isn't too bad, right? We do more before 8 AM than most people . . .
Allison's last post does a better job than I could hope to do of describing Tobin's current interests and development. I offer you a video of a "normal" morning at our house. Lately, T has been waking up early. The night before this video was taken, I had shown him a program I'm using to record and modify audio.We danced to it. When he woke up today, he said "More dance?" when I offered him breakfast. I didn't show him how to replay the music on the computer; he figured it out himself, much as he has figured out the fork and his new racetrack (picture below the video). Oh how I would love to establish a regular posting routine, but alas the best laid plans . . . Nonetheless, I shouldn't let the absence of regularity keep me from posting some random Tobin tidbits on a particularly slow day at the office for me. "T" is for Tobin: Among the many objects Tobin can identify are letters ("lellers"). Matt and I made an effort of pointing out T's on Tobin's alphabet blocks, books, and magnets, as well as on book covers, sweatshirts, and T-shirts. We always say, "T for Tobin." Tobin caught on and now looks for Tobin T's ("Munna T's") whenever he sees "lellers." In fact, about an hour before waking this morning, we heard Tobin say "Munna T, Munna T" in his sleep. Nodding: Tobin now nods to indicate an affirmative response or to otherwise let you know that what you're doing pleases him. Occasionally, he'll even say "yes." The nodding is adorable and a welcome change from the emphatic, yet still mostly polite, no's we hear. No's still outnumber yes's and nods about 4:1, but we'll take what we can get. Geography: Tobin knows that on a normal day Mama and Daddy go to work ("wok"), Hannah stays home ("ho"), and he goes to school ("skoo"). He also knows that Aunt Ashley as well as Aunt Sarah and Uncle Dan (still "Dee!") live in Georgia ("Ju-ja"). We're working on Florida (Mimi and Grandpa) and Kentucky (Grandma and Granddad). We haven't yet tried Louisiana (various including Uncle "Ohll") or Tennessee or Missouri or Texas . . . Goodness, this kid has quite a list of multiple-syllable states to learn! Ashley juice: We learned this past weekend that Tobin likes sweet tea. He named it for the person who let him have a sip of hers and he has since requested it most meals. We're okay with him having it, watered down and decaf. And when this pitcher runs out, we probably won't have it around, so I can stop worrying about giving him such a sugar-laden beverage. But, seriously, he's a Carolina boy, the son of a Georgia girl and a Kentucky boy (who oddly enough doesn't like sweet iced tea) so we feel this fancy was entirely predictable. Life with Tobin is indeed an adventure. Half the time Matt and I feel like we are trying to keep up or figure out what's going on. And for at least the rest of the time, we are simply marveling at our amazing little boy.